Yeah, yeah, I know, the whole world and his wife has read this. In fact nowadays I'm pretty sure babies emerge from the womb already having read it, but I didn't get around to this classic until this year. But why? I imagine to hear you ask for the sake of this review. Why has it taken you so long to read the most stupendous book of all time? Didn't you do English Lit at uni? What's the matter with you? Well, friend, I'll tell you. First of all, I'm British; I was born and raised, for the most part, in England, and in England you tend to look at British authors. I read Shakespeare, Charlotte Brontë and Seamus Heaney at school, and though we did branch out into international authors when I reached my GCSE years, the American book chosen for us was Steinbeck's Of Mice and Men. In fact nobody at my school read To Kill a Mockingbird. When I did my A Levels I read a little more American Literature, this time Fitzgerald's The Great Gatsby, and I loathed it. I know everyone loves it, but I just couldn't stand it. It's so depressing - yes, I know that's the point - but the practical part of me couldn't help thinking 'dude, just move house!' throughout the entire novel. I had to force myself to finish it, and sadly, though it shouldn't have, it put me off American Lit for a while. And the third reason I didn't get around to it until this year was for the simple, stubborn reason that everyone told me I should read it. Hyped books make me very wary, because so often we can build ourselves up to expect one thing and then be incredibly disappointed when we get something else entirely. 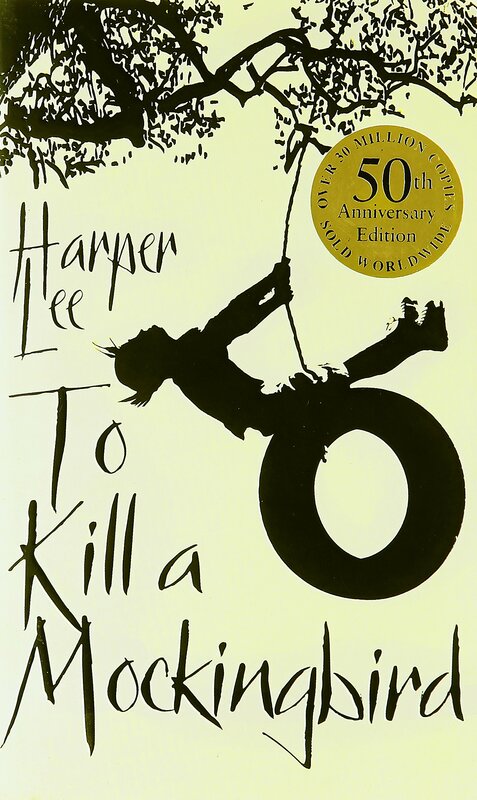 I wanted to read To Kill a Mockingbird, but only when I could go into it with no expectations or preconceptions whatsoever; the same reason I didn't read Rebecca until last year. So now that I've read it, did I love it? Yes. I really, really did. I was almost disappointed when I realised how much I'd enjoyed the book, like I was just 'conforming' or some other ridiculous notion, and then I realised how stupid that was. Some people are cruel enough to say that other people say this is their favourite book because they want to sound smart, and while that may very well be true in some cases (but who cares if it is?) the fact of the matter is some books are well-loved for a reason, and this is one such book. I found Harper Lee's writing so comforting and welcoming, and it settled in me like a delicious roast dinner on a cold day. Scout is a charming protagonist, and she and Jem both felt so real to me; I felt as though I was reading a book by a woman who hadn't forgotten what it was really like to be a child. And then, of course, there's Atticus, who frankly I was incredibly attracted to. What can I say? I like an older man. I adored the cast of characters Lee created, from the Finches to Boo Radley to Tom Robinson, and I was surprised by how lovely the book was. When a book is described as an anti-racist novel or an anti-sexist novel or an anti-any sort of 'ist' novel, it can be difficult not to expect it to be incredibly heavy handed, to knock you over the head with its message so hard you see stars. I didn't feel that with this book at all, and I think a lot of that has to do with it being a coming-of-age novel. When a story is told through the eyes of a child, who is still learning the difference between what is and isn't right and what she believes is and isn't right, any message the book is trying to convey immediately feels all the more authentic because we can see how the characters reach their ultimate conclusion of how they perceive the world. Had the book been from Atticus's point of view, I think it would have been incredibly preachy to the point of disbelief. It's hard to believe anyone could be as perfect as Atticus, but we can believe he might seem that way through the eyes of his children. I loved this book, but I don't think I would have if I'd read it when everyone was telling me to. I needed to approach it in my own way at my own time, and I encourage any of you who haven't read it, but are considering it, to do the same. And if you have no intention of ever reading it, that's fine. This book might be a well-loved classic, but don't force your way through a book you don't think is for you when you could be reading something else you love. It doesn't surprise me that you hadn't read this yet, but I've read it 3 times because I'm American and they shove it down your throat in every lit class you take. I do really enjoy this one, so I'm glad you got to finally experience it and you liked it. Are you thinking of reading the sequel that just came out? I'm not sure I want to yet. I do have a copy of Go Set a Watchman, I just thought it would be something nice to own in years to come, but I'm in no rush to read it. :) I am staying away from reviews of it, though! Yeah I don't know if i want to I've heard it's way different. definitely stay away from reviews.